The 1st idea is the adorable Cupcakes. We had vanilla cupcakes simply iced either pink or green. They were so simple to put together. And they were a HIT at the party. Made a great variety for those that were not interested in the lime slices on the green cupcakes. The other fun party food we had on our table I want to share in this post are our marshmallow pops. 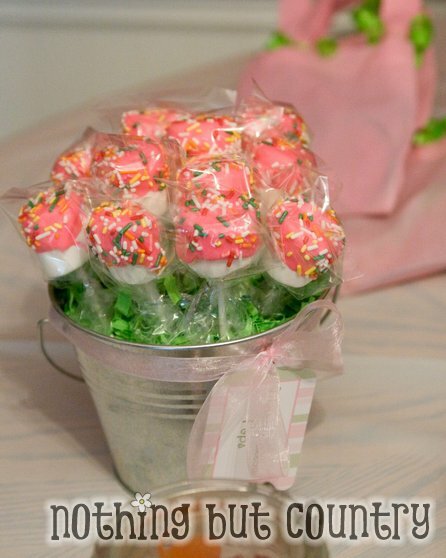 Lollipop sticks put in medium marshmallows, then dipped in pink candy melts then with sprinkles on it. We put the marshmallow pops in a bucket with craft styrofoam in the bottom to stand up. Frog Prince Paperie shared their how-to on the marshmallow pops that inspired us for ours. Such a simple treat that took very little time to make. 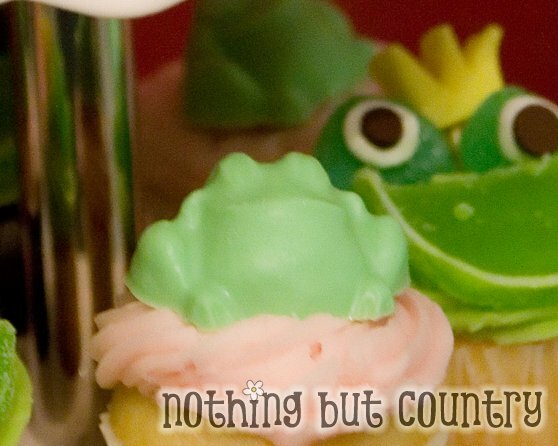 Oh my goodness, those lime slice frog cupcakes are so cute! 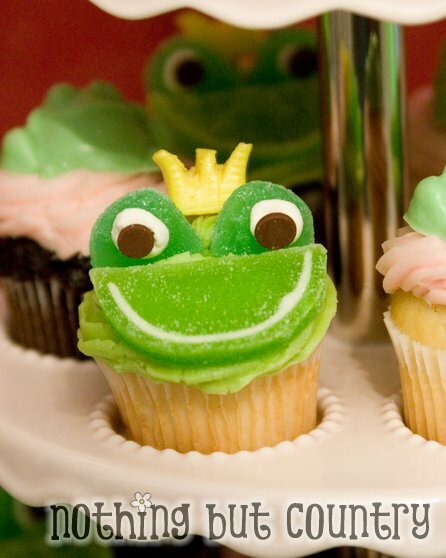 Those frog cupcakes are absolutely the cutest thing I’ve seen in a while. 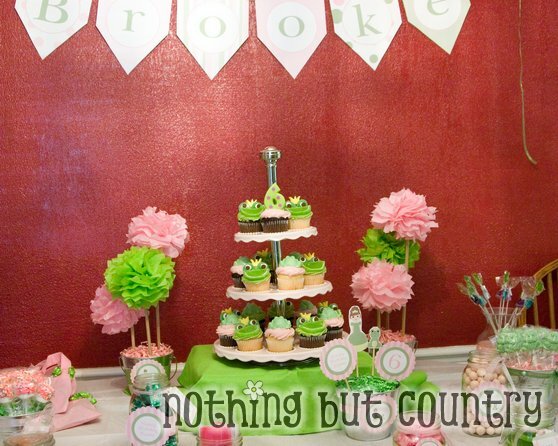 Your party table is just so pretty and girly. I’m going to feature you on my recipes spotlight Wednesday if that is ok. Thanks for sharing your sweet party Have a good one! Thank you so much!! I loved how they turned out too Would love to be featured Thanks!! Stopping by from Skip to My Lou! These are adorable!! Love the colors! I love doing birthday party goodies! I just did a train party for my boys and made the train cake. Fun fun! P.S. I’m your newest follower! Your site is adorable! Hi I followed your link over via your link at ‘Sumo’s Sweet Stuff’. the cupcakes with the frogs made from candy pieces on them, are adorable!!! Gonna stash them away in my ‘Princess Tea Parties’ file. I absolutely ADORE it!! Great job, looks like it was a fabulous party! The from cupcakes are tooo cute!!! Greatt job!!! ADORABLE!!! Thanks for linking up to Mad Skills Monday! Oh my gosh, those have got to be one of the cutest cupcakes I’ve ever seen!!! I love the Marshmallow Pops too. You are so talented!! 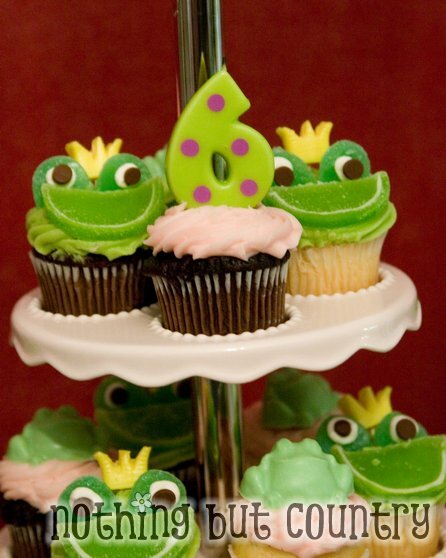 OH MY do I LOVE these froggies…as a self proclaimed cupcake PSYCHO these are some of the cutest ever! Found ya thru Tater Tots and Jeloo ~ great job and super super cute blog. I am a new follower yeah! I love the frog ones! They are so cute, lovely, adorable, simply divine! And the pink cupcakes are beautiful, too I bet your daughter must have been the happiest girl in the world! This is adorable! Bookmarking for my little girl’s 4th birthday party!! Cute frog cupcakes! How fun for a princess party! Those look so cute! I love the cupcake craze that seems to be going on right now! Seems like everybody and their neighbor is making them lately! Again, those are some cute froggys! The cupcakes are sooo cute. Will save idea for future party. Love the cupcake stand. Where did you purchase it?